For Mumm Napa, the season started Wednesday morning at Muir-Hanna Vineyards in the Oak Knoll District, where crews picked nearly 35 tons of Pinot Noir. Mumm Napa’s chief winemaker, Ludovic Dervin was pleased. 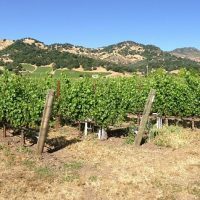 “We had a really beautiful spring and summer when the rest of California was dealing with extreme drought and hot temperatures, the Napa Valley magic worked its way,” Dervin said, noting the cool nights in 50-degree Fahrenheit weather. The sparkling wine grapes harvest started last year at Muir Hanna Vineyards about a week earlier, said owner Bill Hanna. Two years ago, the fruit for Mumm was harvested July 31, said Hanna, a great-grandson of environmentalist John Muir. The Hanna family, which owns about 40 acres, supply fruit for still and sparkling wine programs. Mumm Napa sources grapes from about 1,200 acres in Napa County. The company buys grapes from about 50 growers in Napa County; it also owns a 110-acre estate vineyard which is being replanted, a five-year project. As he watched a crew finish picking the fruit Wednesday morning, Dervin said the first day of harvest is a “rite of passage” between growers and winemakers. By mid-morning, the fruit was hauled to Mumm Napa on the Silverado Trail. Dervin celebrated the start of the harvest by popping open a bottle of Mumm Napa 2014 Grower Series from the Poseidon Vineyards in Carneros. “In remembrance of those who came before us and in commitment to those who will come after us and in loving memory of our founding winemaker Guy Devaux, here is to a great harvest 2018!” said Dervin before sprinkling the grapes with sparkling wine as about 100 employees watched. “Wishing everybody a safe and happy harvest 2018!” as employees cheered. The employees then stood in a wide circle to toast the harvest by pooping open 187 milliliter bottles of Mumm Napa Brut Prestige. Muir-Hanna Vineyards off Orchard Avenue in the Oak Knoll District.